It seems to me that the food scenes in Thailand have in the last few years eased off of the east-west fusion trend. Panaeng curry pizzas are now the thing of the past. The somewhat new trend is to reinvent the old-fashioned, classic dishes. Som Tam(ส้มตำ), the beloved salad featuring crunchy green papaya strands, has been given numerous innovative makeovers. Vegetable tempura Som Tam. Som Tam with salted duck eggs. Som Tam with steamed roe crabs. The list goes on and my head hurts. Just when I thought I couldn’t keep up with all the Som Tam variations, when I visited my beautiful cousin in Ayutthaya last summer, she regaled me with this most unusual version of Som Tam, made with fresh cabbage and raw shrimp. I have seen many versions thus far, yet I’m sure I haven’t seen even half of what’s available out there. Apparently, the modus operandi behind this is: if you can fit it into a krok, you can make Som Tam with it. One of the many new versions of Som Tam wherein various seasonal fresh fruits are used in lieu of green papaya is among some of the most popular reincarnations out there. And it’s for a very good reason too. 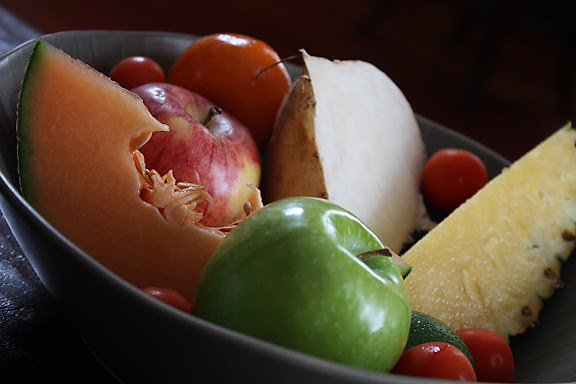 Fresh tropical fruits are inexpensive, plentiful, and available all year round. It would be a shame not to take advantage of them. Besides, Som Tam Phonlamai (ส้มตำผลไม้) makes perfect sense. 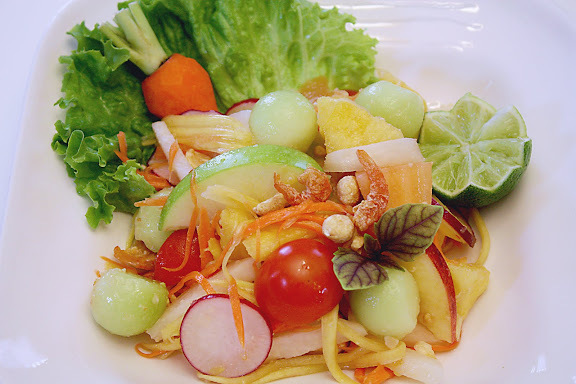 After all, the original version with green papaya as the main star is also a fruit salad even though the Thai mind regards green papaya as more of a vegetable than a fruit. With the standard procedure and the list of essential ingredients in mind, this Thai fruit salad, Som Tam-style, should be a cake walk for everybody. The key is to use fresh fruits with firm and crunchy texture. Your choice of fruits should have flavors that lend themselves well to a sour-salty-sweet salad such as this. Anything soft, watery, gooey, pasty, or sticky does not make a good candidate. (Durian or mangosteen, for example, shouldn’t be part of the mix. Nor should bananas or ripe mangoes.) Some crunchy, mild-flavored vegetables can also be used. Grated zucchini, carrots, or chayote squash come to mind. I’ve also had used under-ripe avocados in the past with great success. Since living in Chicago means I don’t have access to some tropical fruits which would be perfect for this salad, I made do with what I’ve got: a Granny Smith apple and a Fuji apple cut into thin slices, honeydew melon balls, some big dice of cantaloupe and pineapple, grated green mangoes, and some clementine sections. 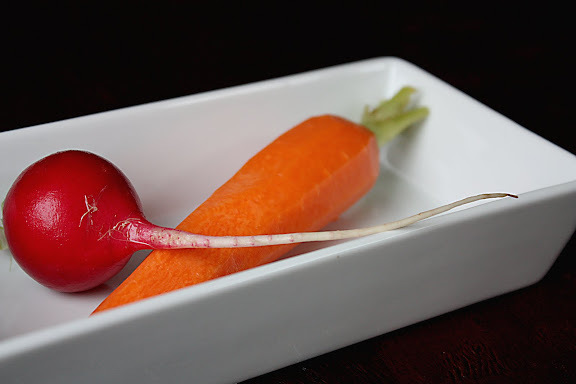 I also threw some vegetables into the mix: a jicama cut into matchsticks, a carrot grated thinly, some halved cherry tomatoes (let’s just agree for convenience’ sake that they’re vegetables in this case) and radishes. (Some sugar snap peas would have been perfect in this, but I didn’t have them on hand at the time.) Use what you like. Mix up flavors and textures. 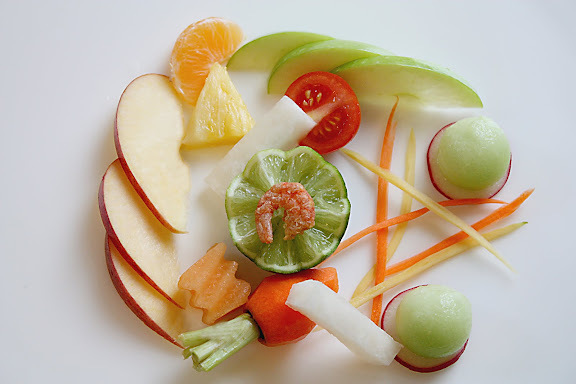 Cutting the fruits into various shapes also makes the finished dish even more interesting to look at and eat. 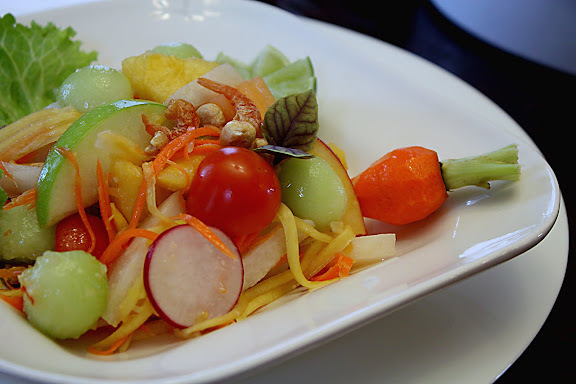 All you have to do is follow the procedure laid out in my post on Thai papaya salad, replacing the shredded green papaya with a mélange of fresh fruits cut into bite-size pieces. For this fruit Som Tam, I usually leave out the long beans. But that’s a personal preference. Be sure to serve the salad immediately. It does not keep. Cut up the fruits that are most susceptible to oxidation, e.g. apples and pears, last. To make this salad vegan, use salt instead of fish sauce. Leave out the dried shrimp. To make this salad vegan and raw, omit the shrimp, use sea salt in place of fish sauce, replace the sugar with raw agave nectar, and use chopped raw almonds instead of roasted peanuts. Yum. I love fruits salads especially one that use seasonal fruits. Thats a great looking salad! That looks amazing, with all the wonderful color and I sense a flavor explosion coming on. I look forward to giving this salad a try and amazing friends and family. What a lovely elegant salad! Nice clicks! So colourful and delicious! I’m not a huge fan of green salads, now this is my kind of salad! Love the colors and it’s so refreshing. pretty colors, pretty textures, pretty nice – may the joys of the holiday season grace your home. OMG! Does this ever look amazing and incredibly refreshing! Wishing you a very happy holiday season! And all the best in 2010!! I found out about it, when I was a patient at Bumrungrad hospital, and there was a little foodstall in the neighbourhood which served this dish. I found only out some weeks ago, that the correct name is SOM TAM and not YUM. After going to Thailand for more than 30 years! Thank you so much for this recipe. I really loved Som Tom Palamai when I lived in Thailand. Lately it’s become my pot lock standard. I think there’s something deliciously surprising about a spicy fruit dish, well outside of Thailand that is, in Thailand it would be surprising for any food not to be spicy. Now I’m living in rural Japan and both foreigner and Japanese friends have raved to me about this dish. You may not approve of this but as fish sauce and palm syrup are hard to come by where I live I use soy sauce and molasses. Sounds strange but it seems to work. I also sprinkle it with shredded coconut which was inspired by the green Mango salad (Yam Mua Muang) that my favorite restaurant in Thailand served. Maybe it’s not kosher on Som Tom but I love it. I also added fresh mint last time. That has everything to do with my love of fresh mind and really nothing at all to do with Thailand as I never ate Som Tom with mint there. When I lived in Thailand I usually ate this dish with a spread of food from the Isaan restaurant near the school where I worked. So now the only problem is that when I make this dish it makes me crave a slew of foods that I can’t come by like som tom mua muang and roasted cat fish with isaan style spicy dipping sauce. Not to mention the company of the sweet people I used to eat it with. Niki – Your fruit dip actually sounds delicious! 🙂 Thanks for sharing. How much, if at all, are you pounding the fruit in this recipe relative to when you’re making som tam with green papaya? Eric – The only things that need to be pounded finely are the garlic and chilies. Then it’s just a matter of looking at the vegetables or fruits which you’re using. Certain things such as green beans, carrots, etc., should go into the mortar first and get pounded until their texture is as soft as the other fruits you might be using such as pineapple, melon, oranges, etc. Once the harder fruits/vegetables have been softened, the softer ones can be added to the mortar without much pounding. You just want to mix them all together with a spoon.